Chino Watch, a Japanese dealer, shown three limited edition models for Seiko’s 130th anniversary. They are the Grand Seiko SBGW033, Brightz Ananta chronograph SAEK015 and shrouded Prospex Diver SBBN021. I love the SBGW033. The automatic chronograph is also good looking and more distinctive than the rest of the Phoenix line. These will be launched in July and August 2011. 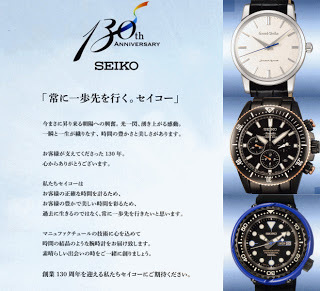 Update 1: Full information on the 2011 novelties from Seiko including the 130th anniversary Grand Seiko can be found here. Update 2: Live photos of the 2011 novelties.